Obviously you would want to look at more problems of this type. But on my 60 problem entry assessment, there are only 3 problems like this. With a multiple guess test you can’t be sure if it’s a result like I wrote about in Part 1. I wrote about Javier who had passed trigonometry by guessing correctly on 2 out of three problems. 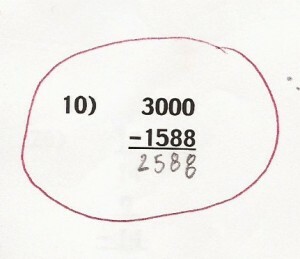 Since letter C) is the correct answer in this example, what if the student didn’t know his multiplication facts and knew nothing of decimals but had remembered that old saw of when in doubt about an answer, mark letter C)? I had a student get all three of them correct on my constructed response test. He showed no work (which was a requirement). I gave an alternative to showing his work: stand there and demonstrate to me you can do it in your head. He could not. Looking at other problems it was plain to see he had little idea of what he was doing. This is also a great illustration of why those who say, “Just give them a calculator or a multiplication grid and they’ll do fine,” are only correct in rare instances. What good is a calculator if you don’t realize (i.e. know on some level whether from rote learning or intuition/discovery) that subtraction and division are not commutative [8-0≠0-8 and 35÷5≠5÷35]? I accused the student who gave me those tragic answers to #10 and #17 of using a calculator on what he perceived as some of the more difficult computations (like #17). He loudly and angrily argued, “You didn’t see me use a calculator!” I reminded him that certain watches, like his, have calculators in them. Anyone could tell that he didn’t use it on every computation because on many of the easier ones (like #10) he showed that he either didn’t know his basic single digit facts or process (both 3rd grade standards). I put him in a 4th grade book which I did with all my students who tested out low (i.e. most of them). He was not happy. 1) The maximal performer never tries the next step until he’s mastered the previous one. 2) He interprets failure as his having done something the wrong way. 3) He quickly discards what doesn’t work and concentrates on what does. 4) The maximal performer specifies his target and focuses on it. For an example of learning to maximize performance and success at all levels, Morehouse & Gross used golf. They said if you wanted to learn the sport of golf, it’s best to start from putting (half of par) rather than the traditional way of starting to learn golf by trying to master driving the ball [p.62]. This accomplishes two goals. It teaches you a fundamental skill and it succeeds right away. That approach worked in my physical training, in my music, and in my math class. I’d put the student in a math book or lesson or whatever seemed appropriate at his or her ‘current stage of…[mathematical] competence’ and ratchet it up one level (i.e. “he/she is exposed to ‘Comprehensible Input’ that belongs to level ‘i + 1’ ”). In my classes there actually were those who genuinely wanted to learn (more than you’d think from reading some of the bizarre behaviors about which I’ve written). They appreciated starting at a comfortable level and usually progressed quite rapidly. Of course, this was after earning their confidence by actually paying attention to what they were doing. grading every assignment and helping each kid when they needed it. All of which takes WAY more time than most teachers are given. I had smaller ratios but 20 to 1 still means 100 kids a day and school dominated my life and my time with grading as well as all the other duties of a classroom teacher. What if the kids don’t take your test seriously? That is a tough question. By the time in their lives when I got most of my students they had been beaten down by a system that paid lip service to caring about them, but they frequently told me they experienced a different reality. They felt cast off by parents, teachers, administrators and a school district too busy justifying its policies by testing. They had been taught that doing poorly on a standardized test had no consequences due to de facto social promotion [see: Unspoken Obstacle]. Doing standardized tests in math class had no effect on their lives so, “Why try?” This also spilled over into student attitudes about school and teachers in general. My success could be directly linked to how much time I had with the student. I had Dashawn, early in my stay at West Hollywood CDS. Dashawn showed his defiance of me and my program by answering every problem on my constructed response arithmetic test with 187. 187 is the California penal code for homicide. I went to the Principal with the student’s test. I wasn’t afraid. But since ‘you never know’, I wanted to make sure the proper authorities knew. Dashawn did’t stay with us long [read: 1 Teacher 2 Outcomes]. I wasn’t successful with him but I didn’t have much opportunity. In Andrés’ case, [Part 1] he was showing his defiance of standardized tests. He had no reason to have faith in standardized tests. I was able to get him to trust me. So when he took my test he actually tried and he scored well enough. He took my program and me seriously enough that he learned some math. He eventually graduated but never did do well on any standardized tests. I had Andrés a bit longer than Dashawn. Then there was Angie, my pride and joy. She looked like defiance personified. She had more tats and piercings than any other student on campus (and we had a lot of tattoos and piercings on campus). I don’t care what a kid looks like. I had an afro and wore platform shoes when I played with a funk band back in the early 70’s! How you treat others, how you treat yourself, and how you work were important in my class, however… Angie didn’t do well on my entrance exams. I put her in the 4th grade book. She worked consistently and was well behaved. She kept getting As. I said to her, “It looks to me like you already know a lot of this basic stuff. Were you having a bad day when you took my entrance exam?” She said, “Yeah , kind of. But I also didn’t know if it was worth it. Let me take it again and this time I’ll try to do well.” She did great. Turned out she was one of my best students and a real honor and treat to teach. I had Angie in class long enough to earn her trust, and that allowed me to be of some help to her. We won an award but time is the issue. Statistics can be helpful but they can also mislead. Our school won an award one year for dramatically increasing our overall test scores. We hung it on the wall and pointed to it proudly, but we smiled when we remembered how we got it. Ours is a school with a high ratio of violent offenders to good kids who did foolish things. Most consistently tested low. When an honor student transferred in (yeah even good kids do crazy things) his scores alone shot up our overall average. We won an award for that! Standardized tests do have a place. There are those parents who would insist that their child should be tested, along with those parents who refused to let their child be tested. Teachers need to be able to choose (or at least have more of a say so than they do now) as to which tests are helpful and which are an intrusion on learning, class by class and – if justifiable – student by student. What really helped Angie (and me) was time. Time for Angie to get to trust that I wouldn’t waste her time. Time for me to learn her strengths rather than assume she needs her weaknesses healed. I never had enough time with any of my kids (is there ever enough?). Don’t assume I’m preaching some pollyanna, feel good, pie in the sky, silver bullet, quick fix. Until we teachers can teach the policy makers and tax payers that we need more time we can expect more of the same [see: Responsibility or Status Quo]. Until we can convince all stakeholders that we need to be able to judge which tests are right for our students we can expect more standardized tests. Testing is necessary or testing is a wast of time? Standardized tests or your own constructed response tests? Portfolios with projects or Standardized test scores? Teach facts or concepts? Either/or is not the question. It is a false dichotomy.